Generate Tamil Jathagam or Tamil Horoscope by date of birth along with Tamil astrology signs, Tamil Astrology Chart and Horoscope reading, free, online. Jathagam also spelled Jathakam, consists of rasi chart, computer jathagam, jathagam kattam, jathaka kurippu, rasi kattam, navamsa chart and South Indian horoscope. Jathagam is an astrology chart of a person, specific to exact birth time, date and place; calculated according to Tamil Astrology method of Jathaka kanippu. Horoscope generator offered by Tamilsonline, enables you to generate your Tamil Jathagam along with Tamil horoscope birth charts, general predictions and mangalya dosham analysis absolutely free. 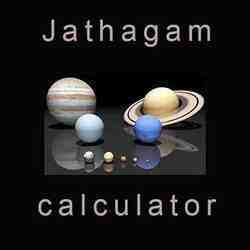 Online jathagam are based on Tamil Thirukanitha panchangam and Lahiri ayanamsam, and displayed in South indian chart format. Any sarpa dosham or chevvai dosham in Tamil horoscope birth chart is clearly identified and given along with jathakam, online. Tamil horoscope by date of birth offered by tamilsonline is a full horoscope reading that includes rasi chart, navamsam chart, dasa, bukthi, etc in a printable format in English and Tamil languages. Jathagam predictions plays a major role in the decision making process in our life, especially on matters related to marriage proposals, investment in shares, home loan or personal loan, opening a bank saving or deposit account, etc. When it comes to generating astrology chart in Tamil by date of birth for future predictions; exact time, date and place of birth are the most important data that determines the planetary positions.